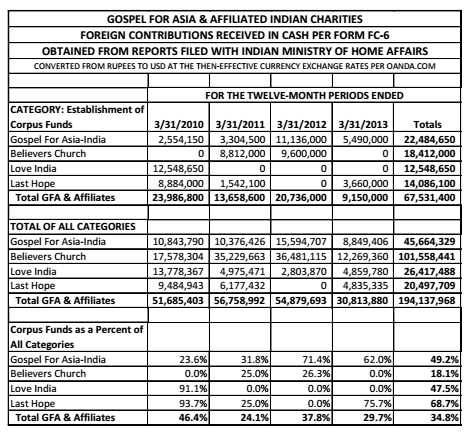 Is Gospel for Asia's Indian Corpus Fund One Reason Why ECFA Terminated GFA's Membership? There is nothing wrong with setting up a corpus fund. In India, organizations can set up a fund and use the interest earned for charitable purposes. However, the donations to the fund are not supposed to be used unless the organization’s existence is threatened. Another important condition is that donations to the corpus fund must be designated for that purpose by the donor, usually in writing. Without designation, donations are not supposed to go to the corpus fund, but rather to the charitable purpose intended by the donor. The evidence I produce here today suggests to me that GFA donor funds have been systematically diverted to the GFA corpus fund apparently without donor designation for that purpose. First, I have access to reports showing all donations to GFA – United States for years 2004-2008, 2010-2014 (2009 was unavailable from my source). None of those reports show any donations to a corpus fund. To illustrate, click through this link to see the 2012 report (it is too long to include in the post). All donations are credited to a specific line item and all line items used by GFA are included in this chart of donations (I have redacted the names of staff and the amount received in their support accounts). I cannot find any line item which refers to a corpus fund. None of the reports going back to 2004 have a line item for the designation of donations to a corpus fund. Now take a look at this chart of GFA contributions prepared by Jason Watkins, a former auditor with a Big 4 accounting firm. This table shows the donor funds sent by GFA to Indian affiliates to establish and maintain corpus funds. I have independently checked the figures in this table. This table also shows the percentage of total giving from GFA -United States to the Indian affiliates. Total corpus fund donations from GFA represents about 35% of all giving from GFA to Indian affiliates since fiscal year 2010. Where did GFA get the money to give to their Indian affiliates? Due to GFA’s claim that 100% of donations designated for the field go to the field, I feel sure many donors think that 100% of what they give goes to a missionary or children or disaster relief or some such good cause. However, the Indian records show that GFA leaders have established a financial cushion for Believers’ Church and related organizations in India with over $67 million from GFA in Texas. Diverting donor money to a corpus fund would violate ECFA guidelines and might have figured in ECFA’s vote to terminate GFA’s membership. In summary, donations toward the corpus fund do not show up on GFA’s comprehensive giving reports. However, in the FC-6 reports in India, millions of dollars in contributions to the corpus funds are listed as coming from GFA in the United States. I ask again where did GFA get that money? Nothing in available reports shows donations earmarked for the corpus fund.